If you have an idea for a comic book, you can't just start drawing right away. You might change your mind along the way and need to modify something, which is why you should always start with a script as if you were preparing a movie. Superscript was created specifically for this purpose. Although writing a script is not among the hardest things you will ever do, there are still a few aspects to consider, like having to write "Panel" or "Character" dozens of times, and no matter how trivial it may seem, you have to admit that your life would be more comfortable if this matter is addressed. The application is free to try for a limited time but without any functionality restrictions. Its setup package is small, and it doesn't take long to download it and install its core components. There are no special tools or services to be installed, and you don't have to worry about the application's hardware requirements. On the surface, Superscript looks like little more than a Notepad with some extra features. You can work on multiple scripts on separate tabs, and when you create a new one, the application will help you get started by creating the appropriate spaces where you need to write a title, author and your firsts panel description. You can start by filling in the blanks, which will help you get used to the working method, if you haven't written a comic book script before. Besides providing you with a clean, distraction-free environment in which you can write your scripts, the software places a few useful functions at your disposal as well. For example, its autocomplete function gives you the possibility of creating new pages at a moment's notice and relieves you from writing repetitive words like "Page" or "Panel". Furthermore, to help you keep track of your content, the software displays page numbers on the left side of its interface, and it lets you mark them and jump to them with a single click. Another thing you can do is add comments on the right side of the window, next to individual lines, if you feel like you need to revisit certain sections. Regardless of how you look at Superscript, this piece of software is certainly a good choice for writing comic book scripts. 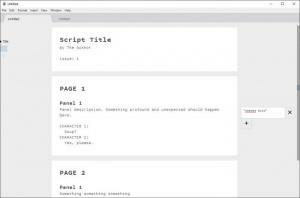 The software lets you work in an environment designed specifically for writing comic scripts. It has a clean and simple user interface and easy-to-master controls. You can have it up and running in no time, without any effort. You can download Superscript free here.